About 10 miles south of Newport on the Oregon Coast. Aperture f/22 to catch the sum burst. Processing in Photoshop CC 2015. It was the day after Thanksgiving and there was not a cloud in the sky on the Oregon Coast! 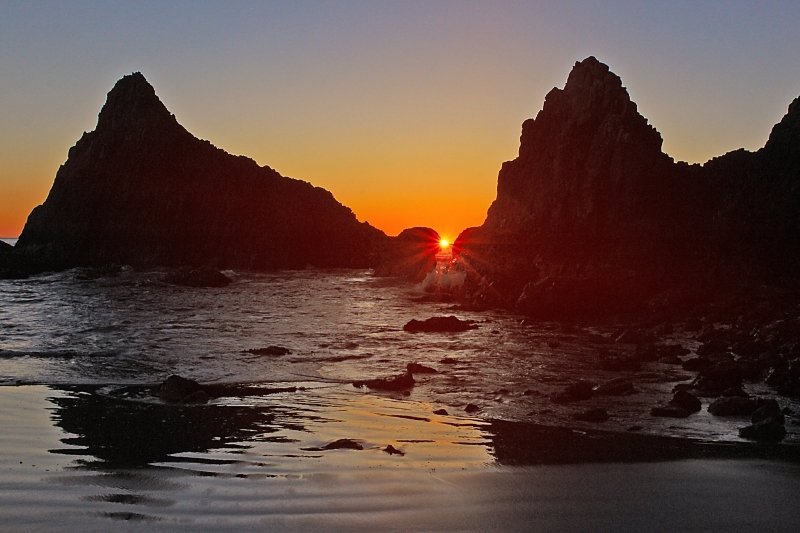 Sally and I decided to go for a sunset walk on the beach at Seal Rock, where there are interesting rock formations. We got there just as the sun was setting. It was glorious! There was a super low tide in progress. Seal Rock is known for it's interesting rock formations and patterns on the beach. The best time is low tide when you can get out close to the rock formations and other interesting shapes, tide pools, and patterns on the beach. The sun was just at the right angle to get a sunburst. Sally spotted this view where the sun was just dropping into an opening between two large rock formations. There was just enough time to get this sunburst shot as the sun was about to dip below the horizon. So we caught the magic moment! !